Thousands of Tibetan students stage protests amid rising concerns over the erosion of Tibetan culture, language, and national identity in regions ruled by China. Thousands of Tibetan students in China’s western Qinghai province have protested a forced change in the language of their instruction from Tibetan to Chinese, according to Tibetan sources. “On Oct. 19, over 7,000 Tibetan students protested in Rebkong [in Chinese, Tongren] in the Malho [in Chinese, Huangnan] prefecture in Qinghai,” said Rebkong Tenzin, a Tibetan living in India and citing sources in Tibet. “The students came from six different schools in the area,” he said, naming the First Nationalities Middle School of Rebkong Tongren, the Tongren County Yifu Nationalities Middle School, the Tongren District Residential School, the Tongren Modern Medicine College, the Malho National Teacher Training Institute, and the Malho Nationalities Middle School. 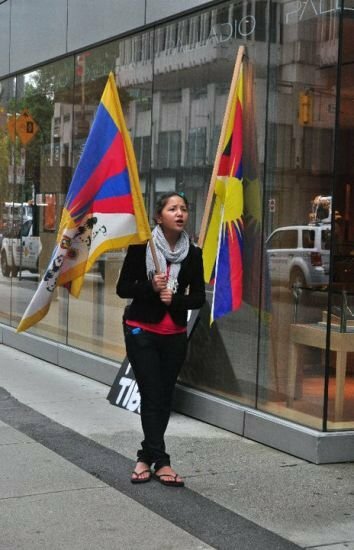 The protesters carried banners, written in both Tibetan and Chinese, reading “Equality Among Nationalities” and “Expand the Use of the Tibetan Language,” sources said. Monks from nearby Rebkong Rongpo monastery joined in the protest after it began, though the students at first asked them not to take part, said a monk in Rebkong. “They feared that the monks’ involvement could provoke the Chinese authorities to send armed Public Security Bureau officers to crack down on the protesters,” the monk said. Estimates of the numbers of protesters ranged up to 1,000 according to some sources and from 5,000-7,000 according to other sources. No official confirmation of the protest size could be obtained. The protests began in the morning at the Tongren Nationalities Middle School and continued until about 2 p.m., according to a Tibetan living in the area. “At that time, about 20 to 30 police vehicles arrived and surrounded the protesters,” the source said. “No detentions or arrests were made,” he added. Another Tibetan living in Rebkong said that prefecture officials arrived at about the same time and urged calm. “These were Ah Gendun, the deputy head of the Malho prefecture, and Seru Gyaltsen, head of the Malho Education Department,” the Tibetan wrote on his blog. “They assured [the protesters] that their grievances would be addressed by senior authorities of the prefecture and province,” he said. Calls seeking comment from the office of the Rebkong Public Security Bureau were answered by a recorded, general announcement. The protests come amid rising concerns over the erosion of Tibetan culture, language, and national identity in Tibetan regions ruled by China. “In a recent meeting of the Education Department of Qinghai province, the local Communist Party Secretary and Chairman ordered that the language used in textbooks should be changed to Chinese,” a source inside Tibet said. “Under instruction from provincial authorities, Tibetan teachers were then ordered to attend workshops on the change of the medium of instruction from Tibetan to Chinese,” he said. Protest posters had appeared several months earlier in Tsoe [in Chinese, Hezuo] county in Gansu province when students there were forced to use textbooks translated into Chinese, according to the source in Tibet. “The number of Tibetans admitted to schools in the area was also reduced, and some Tibetan teachers and staff were fired from their jobs for no apparent reason,” he said.